Huge congratulations to Vicky and Daniel who were married at the Roslin Beach Hotel, our favourite venue in Southend on Sea, Essex on Saturday 20th May 2017. The happy couple chose to have a 3 tier naked wedding cake, displayed on our tree slice cake stand. 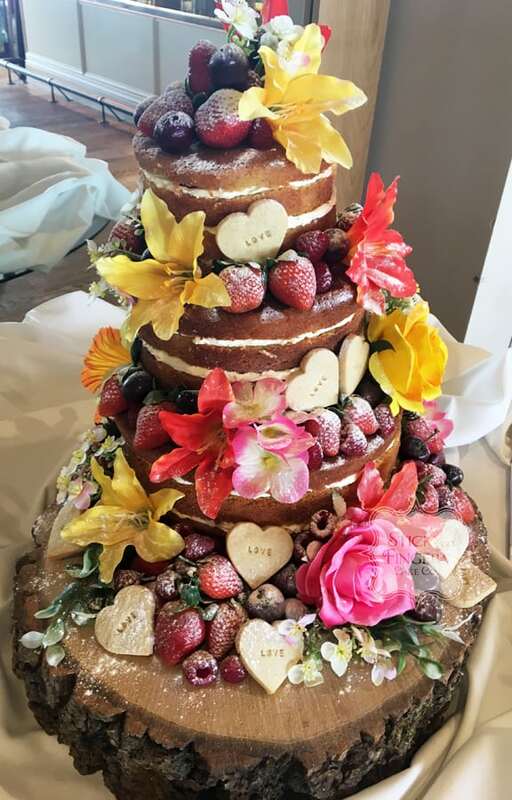 Decorated with an array of brightly coloured artificial flowers, mixed fresh red berries and cute heart shaped cookies, It looked amazing once it was finished! The flavours they chose to have were Cherry Bakewell and 2 tiers of Madagascan Vanilla. Wishing you both a very long and happy life together.